In our effort to be strong, we may be unkind. Be kind with accuracy. Accuracy is the cool aspect of kindness. Say something that is sharp and has feeling at once. When we’re kind, we don’t feel sharp. When we’re sharp, we don’t feel kind. Aesthetic Realism says we can be both at the same time. It is necessary to be. 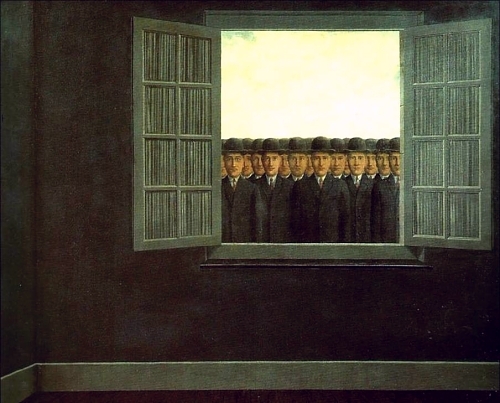 It was necessary for Magritte; all his paintings show this is what he wanted. The painting Intimate Journal, painted in 1951, is a work I care for, because I believe it shows the artist’s deep desire to melt, be kinder, and at the same time maintain himself. 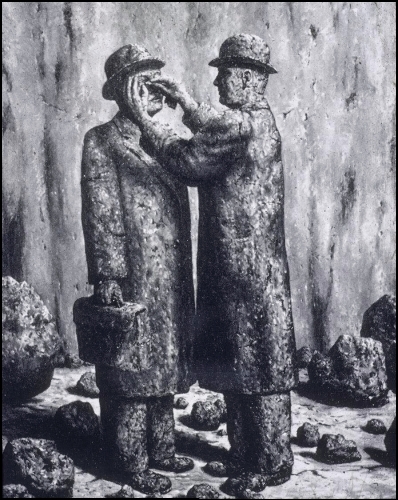 Here, one stone man is gently taking out a speck of dirt from another stone man’s eye. 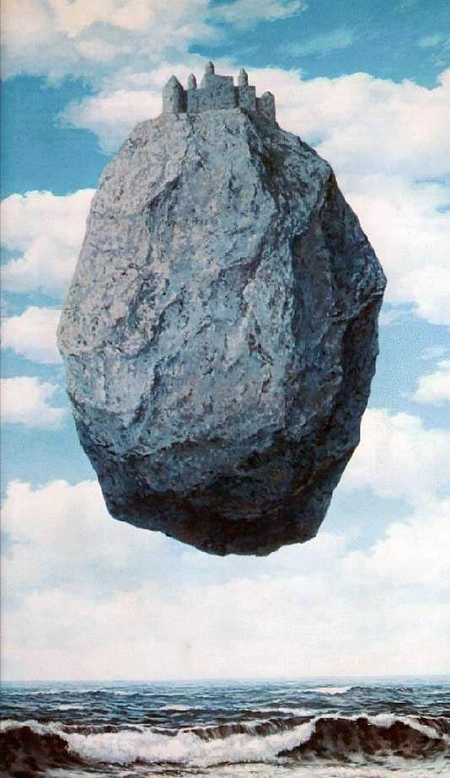 Magritte has shown that living men can turn to stone, be unfeeling; then, in an act of kindness, they become softer, yielding with accuracy, sharpness, and point. Eli Siegel was himself kindness as accuracy, accuracy as kindness, and he taught me a new way of seeing the world, as he might have taught Magritte. The Belgian artist was looking for someone to take impediments from his eyes, too. I think he wanted to be comprehended, as I was. In daily life he is prey to perpetual ambivalences. On one hand he hates being alone. Yet to have to get out of the house, pay a visit, see people, these are painful prospects for him; nevertheless, out he goes, there’s no holding him back. Contact with fellow men is precious to him, and also unbearable. He is eager to communicate, receptive, hospitable; but it’s not long ere one detects a shadow of disappointment creep over him, sometimes even the beginning of impatience. Aesthetic Realism teaches that the only way to be alone and be able to trust one’s thoughts is to like the way you think about other people. It is the artist’s purpose, and it should be our purpose all the time. Here are two paintings in which the artist shows how much he wanted the outside world to intrude, even invade his private world. In Month of the Grape Harvest, we are inside a bare room, confronted by a crowd of almost identical looking men, peering in from the outside. They have something of the anonymous quality of a Greek chorus, they are the People; if we try to shut them out, they come to windows to confront us. 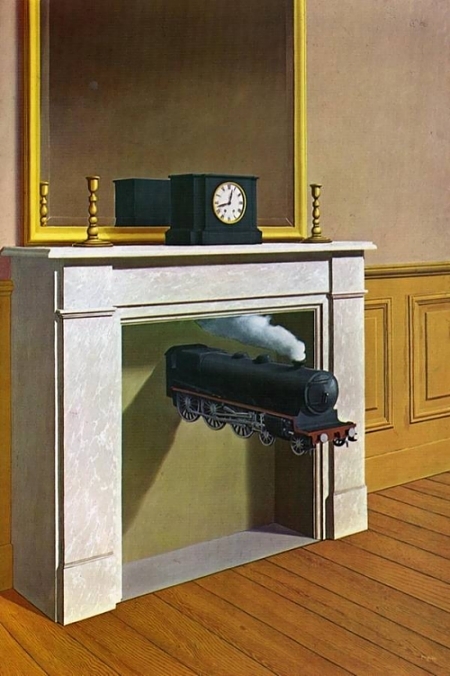 Time Transfixed is probably one of the most popular of Magritte’s paintings. It is about excitement and peace, wanting things unpredictable and noisy on one hand, quiet, predictable and neat on the other. This scene puts together the shocking and the precise. The forms are crisp, the room tidy, the colors are quiet and bland, yet they have a strange intensity. The humdrum becomes wonderful. Just look at that small locomotive. It disturbs the fireplace, often the center of comfort in a home—and enters our consciousness much the way the eye in the ham steak did. The propriety of this room is at once composed and disquieting, frozen and in motion. The circle in the nose of the locomotive is like that of the clock above. The geometric forms of the noisy intruder from the outside world are related to the rectangles and circles of the room. This room shakes us up and composes us at once, and I’ve learned from Aesthetic Realism, that is the purpose of art itself. This is the feeling, too, I’m so grateful to have experienced in Aesthetic Realism lessons with Eli Siegel. Is there is all art, …the presence of what makes for lightness, release….Is there the presence, too, of what makes for stability, solidity, seriousness?—is the state of mind making for art both heavier and lighter than that which is customary? The creation of new objects; the transformation of known objects, for certain objects a change of substance, a wooden sky, for instance…. 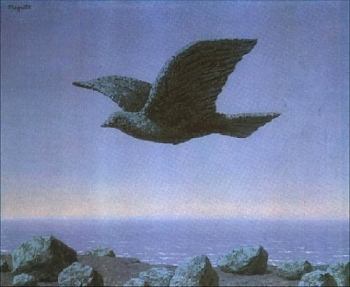 Rene Magritte had the human problem of fixity and motion, related to heaviness and lightness, and that problem is present in The Idol, where a stone bird is too immobile and heavy. We do not feel weight has become light beautifully. I believe Aesthetic Realism explains the technical difficulty in this and other paintings by the Belgian surrealist. He never decided wholly which made him free, being separate and away from people, like a bird flying alone in the sky, or being of the selves of other people and the diversity of the world. This bird is heavy and stuck. It represents a false notion of freedom which I’ve learned we don’t have to be stuck with. This is certainly one of the most important ways I have changed through my study of Aesthetic Realism. Clearly, in calling for this unsparing examination of his work…he was voicing a far-reaching concern, a question relating to the whole of his life’s endeavor and the direction he had taken. In Castle of the Pyrenees of 1959, however, heaviness and lightness work together for one purpose and the painting is beautiful. The massive and rocky has successfully and surprisingly been made buoyant and light. Magritte presents an impossible situation, an imagined situation, solidly, substantially. Painted almost photographically, we believe what is happening. The heavy rock and castle, floating in space, become lighter and their pale bluish color shows they are also somewhat insubstantial and spacious, like the atmosphere around them. The symmetrical design makes for a feeling of sobriety in the midst of humor. We feel something like religious awe at what is happening, something large and grand, with all time and space present. Every artist and every person can have his and her life be more like a work of art, be more beautiful. We can learn how to. That is the grand and kind purpose of the Aesthetic Realism of Eli Siegel which I have the honor to study and teach.